This easy party appetizer takes just 15 minutes to prepare. 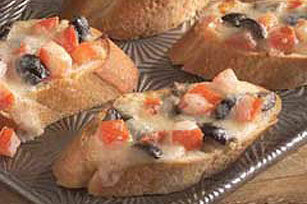 Even your guests who don’t like olives will think they’re a hit! Preheat broiler to high. Mix mayo and garlic powder in small bowl. Stir in cheese, tomato and olives. Cut each bread loaf diagonally into 24 slices; place on baking sheet. Spread evenly with cheese mixture. Broil, 4 to 6 inches from heat, 2 min. or until cheese is melted. Serve warm. To seed tomatoes, cut in half horizontally. Gently squeeze each half to remove the seeds and juice. Makes 48 servings, 1 slice each.